BEIJING, May 17 (Xinhua) -- Chinese President Xi Jinping pledged on Wednesday to enhance practical cooperation with Cambodia and implement plans and projects to promote the Belt and Road Initiative. 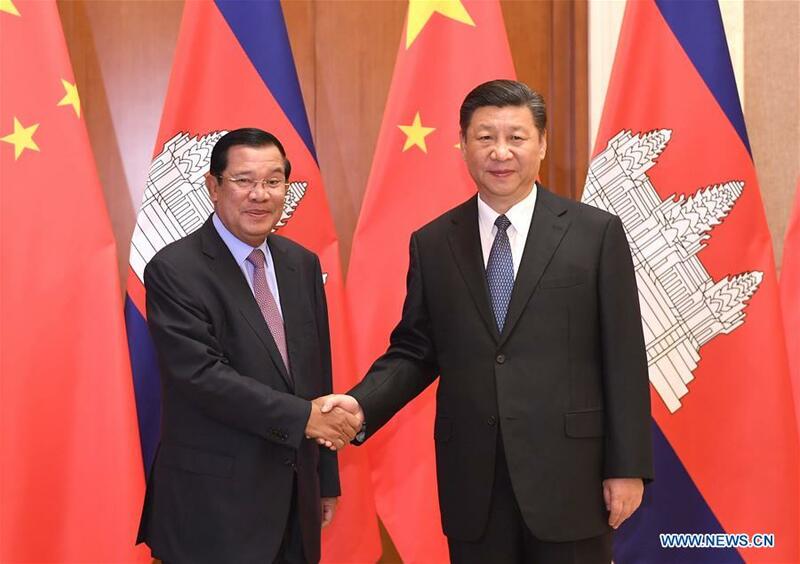 Xi told visiting Cambodian Prime Minister Hun Sen that China attaches great importance to ties with Cambodia and stands ready to enhance the comprehensive strategic cooperation and contribute to regional peace and prosperity. Next year marks the 60th anniversary of diplomatic ties of China and Cambodia, an opportunity to further promote bilateral relations. Xi called on both sides to enhance practical cooperation and implement plans and projects to promote Belt and Road Initiative construction, especially in capacity cooperation and investment. Both countries should strengthen links between their economies and cooperate on trade, law enforcement, security, anti-terrorism and combating cyber crime, while developing people-to-people exchanges in tourism, culture and education, Xi said. For his part, Hun Sen said Cambodia is ready to work with China to consolidate the traditional friendship and on the comprehensive strategic cooperative partnership. He called on the two countries to expand practical cooperation in development, poverty reduction, health, security, and combating transnational crime, and to strengthen coordination in international and regional affairs. Later in the day, China and Cambodia issued a joint press communique. In the communique, the two sides expected bilateral trade to reach 6 billion U.S. dollars by 2020. On the South China Sea issue, both agreed it should be solved through dialogue and coordination by countries directly involved. China is willing to implement the Declaration on the Code of Conduct on the South China Sea with ASEAN members including Cambodia, and promote the negotiations on the code of conduct on the South China Sea, the communique said.